Having witnessed firsthand the passion of Panamanian boxers, there is something magical about their attitude and approach to the sport. Walk into any gym in the country and watch the attention to detail, the focus, and the myriad styles; for many young fighters, that type of education is impossible to receive anywhere else. Therefore, it’s no secret that countless fighters have traveled to Panama to sharpen their skills. Three names that grace this list are Alexis Arguello, Wilfredo Gomez, and most recently, Jamaican Nicholas “The Axe Man” Walters. Initially, Alexis Arguello was sent by his manager, Eduardo Roman in 1974 to Panama to train with Curro Dossman. After Arguello’s eye-opening loss to a superior boxer, Ernesto “Nato” Marcel, in 1974, Roman knew firsthand that Panama resembled a boxing enclave that was more advanced and specifically more beneficial to fighters under 140 pounds. He was also cultivating connections with military brass, who, in the early to mid-1970s, controlled the sport. According to Roman, Panama and Mexico had created the ideal boxing blueprint to follow, while Nicaragua was still struggling to find its boxing identity. Although the combination didn’t lead to a world championship (Arguello won his first title after he left Dossman), Arguello got the necessary work and experience. Innately, Arguello understood what he needed to work on and take from several trainers he worked with including Dossman, Mexico’s Pepe Morales and Cuyo Hernandez, and, later, Eddie Futch. Similarly, Puerto Rican icon Wilfredo “Bazooka” Gomez also established his boxing roots in Panama. In the early-1970s, he started his boxing education in Panama under the tutelage of Pellin Avila and Plomo Espinosa and eventually fought Panamanian Jacinto Fuentes to a draw in his professional debut in 1974. When Gomez returned to Panama in 2003 after a long layoff, he attributed a lot of his boxing success to his time in Panama. “I have great memories of my time in Panama,” Gomez told reporters in 2003 when he returned to Panama. However, Gomez returned to local trainers in his homeland to propel him to his first world title. In subsequent interviews, Gomez would call Panama his second home. Most recently, Panama has adopted featherweight world champ, Nicholas Walters. Haitian businessman and boxing insider, Jacques Deschamps, who joined Hector Villarreal, Dr. Roberto Grimaldo and others to form Premium Boxing Promotions, brought Walters to Panama and currently represents him. Walters, who trained with his father and former professional boxer, Joe Walters, since he was five, was a “pure treasure found by Deschamps” according to Villarreal. Walters wields an axe sharpened by the top Panamanian trainers. A coincidence? I think not. “It’s probably the different styles that Panamanian boxing has that brings them here,” said Panamanian boxing manager, Carlos Gonzalez. 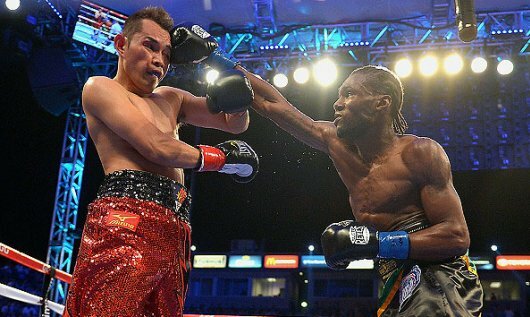 Recently, Walters earned his biggest victory to date as he systematically broke down an experienced and classy champion in Nonito Donaire behind a consistent jab, an equally as impressive uppercut, and a straight right hand that rivals the best in the sport. The victory was not lost on the Panamanian people. Yet, it wasn’t the offensive onslaught that proved to be his best attribute. Walters could have easily panicked, or even wilted, under Donaire’s left hook in the first couple rounds. In fact, a lesser, more inexperienced fighter may have sprinted out in the third round after being tagged at the bell ending the previous round and looked for the quick knockout. Instead, Walters went back to his jab, stayed composed and relied on combinations to set up a right hand that had fight people immediately talking retirement for Donaire. His composure and poise are hallmarks of another Panamanian fighter, Anselmo Moreno, who, under the same trainer, Celso Chavez, faced his biggest challenges during difficult sparring sessions in Panama. It would be easy to suggest that one-punch power compensates for other mistakes, but Walters is anything but one-dimensional. Having spent a lot of time working in the highly regarded Pedro Alcazar Gym in Curundu, a district in Panama City, Walters is not a fighter who relies on one-punch power to get himself out of trouble. Rather, he’s a tactical fighter who knows when to take charge or sit back. More importantly, Walters doesn’t blindly wade in and throw punches as some knockout punches do. He patiently waits for openings to present themselves and then capitalizes. When you train in Panama, you see excellent, hungry fighters on a daily basis. In addition, with a proven trainer like Chavez, Walters is always learning. The Panamanian boxing fraternity is a family. Everyone has an opinion about the classic stylist, Ismael Laguna, the defensive genius, Hilario Zapata, the legend, Roberto Duran, but the natural comparison has to be with the featherweight standard, Eusebio Pedroza. Despite being more aggressive and physical in his prime, Pedroza was also a huge 126-pounder who helped redefine the weight class. Pedroza was a specimen who used to intimidate fighters with every inch of his 5-foot-8 frame. Even though Walters is lankier and more likely to stay on the outside and pick his shots, I still see a little of Pedroza in Walters. What I do know is that Walters joins an elite list of fighters who used Panama as a foundation to jump start his career. And that may just prove to be the best education that any boxer can have.